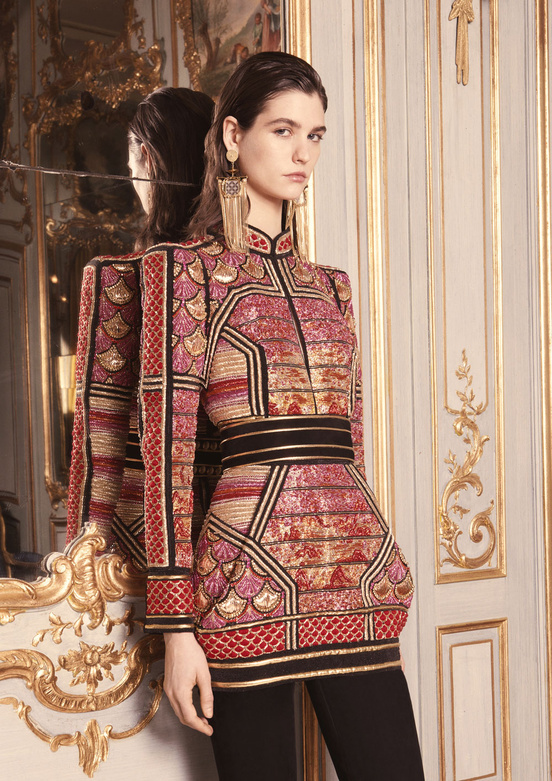 Peter Beard’s photographs of Africa have influenced the Balmain by Olivier Rousteing Pre-Fall 2014 Collection. Other Peter Beard-inspired collections : Dannijo Spring/Summer 2013 (the presentation of this Montauk-influenced jewelry collection was based on Peter Beard’s mood boards and use of collage), Louis Vuitton by Kim Jones Spring/Summer 2012 Menswear (the tribal references of this show were a tribute to Peter Beard’s work), Max Azria Resort 2011 (this collection paid homage to Peter Beard’s photographs of Africa), Michael Kors Spring/Summer 2012 (Peter Beard was one of the influences of this Africa-themed show), Paul & Joe Spring/Summer 2013 Menswear (this collection referenced a Peter Beard-style African trip), Tibi Autumn/Winter 2010-2011 (the color palette of this show was based on Peter Beard’s images), Todd Lynn Spring/Summer 2013 (the beauty and the horror in Peter Beard’s images inspired this show). For the Balmain Spring/Summer 2012 Show, Olivier Rousteing mixed Mexico’s tailoring with Las Vegas’ glamour. Other Mexico-inspired collections : Aime Autumn/Winter 2012-2013 (for this jewelry line, Magali Pont took inspiration from the Mexico of Frida Kahlo), Bezem y Mailan (in 2012, for her line, Mai Lan took inspiration from Mexico and Frida Kahlo), Felipe Oliveira Baptista Couture Autumn/Winter 2007-2008 (collection based on the outfits of the Mexican wrestlers), Holly Fulton Spring/Summer 2013 (inspired by a Mexican beach, in the ’60s), Jean Paul Gaultier Spring/Summer 1998 (« Homage to Frida Kahlo / Hommage à Frida Kahlo » collection), Jean Paul Gaultier Couture Spring/Summer 2010, Kenzo by Antonio Marras Autumn/Winter 2011-2012 (influenced by the female artists who lived in Mexico, including Frida Kahlo and Tina Modotti), Lulu & Co Studio Spring/Summer 2012 (capsule line inspired by Lulu Kennedy’s trips to Mexico), Mars Loves Her Spring/Summer 2012 (this collection, presented as part of French « ELLE » Fashion Lab, took inspiration from Mexico’s colors), Maya Hansen Spring/Summer 2013 (this Frida Kahlo-inspired collection references Mexico via « skulls » and « watermelons » prints), Moschino Spring/Summer 2005, Paul & Joe® Spring/Summer 2012 (the imaginary muse of this collection rode her motorbike from the Southwest to Mexico), Ralph Lauren Spring/Summer 2013 (in part), The Lake and Stars Spring/Summer 2012 (similarities between ’50s Mexican conventions and style, and those of the Mexico of 2012), Valentino by Maria Grazia Chiuri and Pier Paolo Piccioli Spring/Summer 2012 (inspired by Mexico in the beginning of the 20th century), Vena Cava Spring/Summer 2013 (inspired by Sophie Buhai and Lisa Mayock’s trips to Mexico, in the ’80s), Victor Dzenk Autumn/Winter 2007-2008. Miami inspired the Balmain by Olivier Rousteing Resort 2013 Collection. Other Miami-influenced collections : Chanel by Karl Lagerfeld Resort 2009 (Miami’s colors inspired this show which was presented over the Raleigh hotel’s pool, in South Beach, Miami, on May 15, 2008), Kat Maconie for Dune (this footwear line, available in January 2012, featured pieces that were designed for the kind of girl who parties by the pool at the Delano, on South Beach), Peter Som Spring/Summer 2011 (this collection drew inspiration from Miami Beach), River Island (for Spring/Summer 2012, River Island launched the « Miami » collection). The wicker chairs of Cuba inspired the Balmain by Olivier Rousteing Spring/Summer 2013 Show. Other Cuba-influenced collections : Lilith Spring/Summer 2010 (this collection paid homage to Cuba in the ’50s), Matthew Williamson Resort 2009 (the tropical prints of this collection paid tribute to Cuba’s natural landscape), Misha Nonoo Spring/Summer 2013 (Cuba inspired the motifs and the tropical palette of this collection), Paul Smith Autumn/Winter 2013-2014 (the bold colors of some pieces were inspired by Cuba’s). Diana Vreeland, and her famous quote, « Elegance is refusal », inspired the Balmain by Olivier Rousteing Pre-Fall 2013 Collection. Other Diana Vreeland-influenced collections : Armani Privé Autumn/Winter 2010-2011 (the jewelry was inspired by Diana Vreeland), Atelier Swarovski (this jewelry line, named « Diana Vreeland Legacy Collection », and made in collaboration with Diana Vreeland’s heirs, was launched in September 2012), Diane von Furstenberg Autumn/Winter 2011-2012 (this collection, dubbed « American Legend », was a tribute to 3 iconic women, including Diana Vreeland), Emilia Wickstead Autumn/Winter 2013-2014 (this collection was an homage to Diana Vreeland, as a working woman), Etro Autumn/Winter 2010-2011 (the pieces were imagined as the possessions of fashion icons such as Diana Vreeland), Jil Sander by Raf Simons Autumn/Winter 2011-2012 (the « skiing » editorials that Diana Vreeland did at « Vogue » were one of the influences of this show), Louis Vuitton by Kim Jones Autumn/Winter 2013-2014 Menswear (Kim Jones commissioned Jake and Dinos Chapman to produce a floral print, dubbed « Garden in Hell », which was based on Diana Vreeland’s apartment), Mary Katrantzou Autumn/Winter 2011-2012 (the starting point of this collection was, among other things, Diana Vreeland’s home), Preen by Justin Thornton and Thea Bregazzi Autumn/Winter 2011-2012 (this collection was an ode to Diana Vreeland’s style which mixed classical European pieces with caftans and huge jewelry).